Cricketer MS Dhoni dressed in his Army uniform for the ceremony. New Delhi: Former Indian skipper Mahendra Singh Dhoni and billiards champion Pankaj Advani today received Padma Bhushan awards from President Ram Nath Kovind. Weightlifter Saikhom Mirabai Chanu and former Asian Games gold medallist tennis player Somdev Devvarman were honoured with the Padma Shri award at the Rashtrapati Bhavan. Vice President M Venkaiah Naidu, Prime Minister Narendra Modi, Home Minister Rajnath Singh -- who had last night hosted a dinner for the 41 awardees who were honoured today -- and Lok Sabha Speaker Sumitra Mahajan were also present at the ceremony. 37-year-old Dhoni was conferred the honorary rank of Lieutenant Colonel by the Indian Territorial Army in November 2011, months after he led his team to bring home its second World Cup. 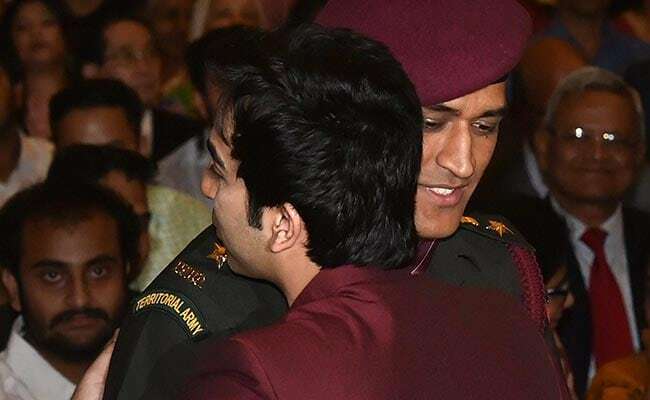 When his name was announced, Mr Dhoni, dressed in the Army uniform, walked like a soldier to receive the award. Mr Dhoni has won several awards, including the ICC ODI Player of the Year award in 2008 and 2009 (the first player to win the award twice), the Rajiv Gandhi Khel Ratna award in 2007 and the Padma Shri, India's fourth highest civilian honour in 2009. MS Dhoni and cueist Pankaj Advani celebrated their win with a hug. Besides Mr Dhoni, folk artiste Sharda Sinha and contemporary Indian artist Laxman Pai were also honoured with the Padma Bhushan. Veteran actor Manoj Joshi; Dasmodar Ganesh Bapat, who is working towards eradication of leprosy; Manipur-based weaver L Subadani Devi; Karanataka-based Sufi bhajan singer Ibrahim Nabisaheb Sutar, wildlife conservationist Romulus Whitaker and Mizoram-based educationist A Zakia were conferred the Padma Shri. Earlier in March, President Kovind had awarded the first batch of Padma Awardees. Noted music composer Illaiyaraja, Hindustani classical singer Ghulam Mustafa Khan, senior Rashtriya Swayamsevak Sangh (RSS) ideologue P Parameswaran, Kerala Bishop Philipose Mar Chrysostom, tennis player Somdev Devvarman, Indian badminton star Kidambi Srikanth, and 1972 Paralympics gold medallist swimmer Murlikant Petkar were among the recipients at the ceremony on March 20. This year, 85 Padma Awards were announced. Also on the list of awardees were 10 individuals, one each from the 10 ASEAN countries whose leaders had attended the Republic Day parade. The awards are given in three categories -- Padma Vibhushan, Padma Bhushan and Padma Shri and the names of the winners are announced on the eve of Republic Day every year. Watch: Here's How Ziva Dhoni Ensures Her Father MS Dhoni Eats Healthy!